December 19 2014, 11:25 AM EST. 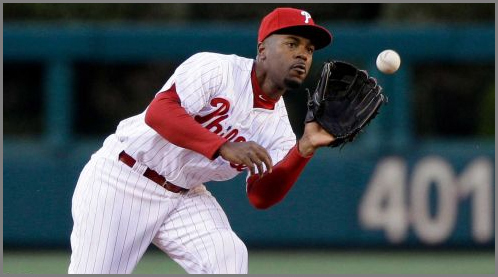 It may have taken more than nine days to become official, but Jimmy Rollins' tenure in Philadelphia has come to an end. The 36-year-old shortstop was traded to the Los Angeles Dodgers on Friday for minor-league pitchers Zach Eflin and Tom Windle. Though agreed upon on principle last week, the Phillies were waiting on the Dodgers to complete their trade of outfielder Matt Kemp to the San Diego Padres before confirming Rollins' departure. Eflin was included in the package the Dodgers received from the Padres in exchange for Kemp. A three-time All-Star, Rollins spent his entire 15-year career in Philadelphia and leaves as the franchise's all-time hits leader. He also holds club records for at-bats and doubles. The switch-hitting Rollins batted .243 with 17 home runs, 55 RBIs and 28 stolen bases last season. He is owed $11 million in 2015 - the final year of his contract. The Phillies will include $1 million to the Dodgers in the deal. Eflin, a 20-year-old right-hander, spent last year with single-A Lake Elsinore and finished with a 3.80 ERA over 24 starts. According to scouts, his curve ball is a well developed but he lacks a strong third pitch. He was not ranked by Baseball America among the Padres top 10 prospects. Windle, a 22-year-old left-hander, pitched for class-A Rancho Cucamonga last year and over 25 starts put together a 4.26 ERA. Baseball America ranked him just outside the organization's top 10 prospects.